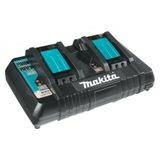 18V LXT® LITHIUM-ION DUAL PORT RAPID OPTIMUM CHARGER | Tallman Equipment Co., Inc.
Makita LXT® is the world’s largest cordless tool system powered by 18V Lithium-Ion slide-style batteries. At the heart of the LXT® System is the 18V LXT® Lithium-Ion battery and the efficient Rapid Optimum Charger. The 18V Lithium-Ion Dual Port Rapid Optimum Charger (DC18RD) charges two batteries at the same time, giving tool users unparalleled charging efficiency so their batteries spend more time working and less time sitting on the charger. 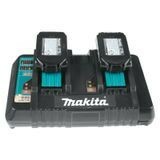 The 18V Dual Port Rapid Optimum Charger offers key advantages for Makita 18V Lithium-Ion cordless tool users. The exclusive built-in fan cools the battery by forcing air through the battery's air vents during the charging process for faster charging. The charger communicates with the battery's built-in chip throughout the charging process to optimize battery life by actively controlling current, voltage and temperature. The result is category-leading charge times: two 18V Compact Lithium-Ion 2.0Ah batteries in only 25 minutes; two 18V LXT® Lithium-Ion 3.0Ah batteries in only 30 minutes; two 18V LXT® Lithium-Ion 4.0Ah batteries in only 40 minutes; two 18V LXT® Lithium-Ion 5.0Ah batteries in only 45 minutes.